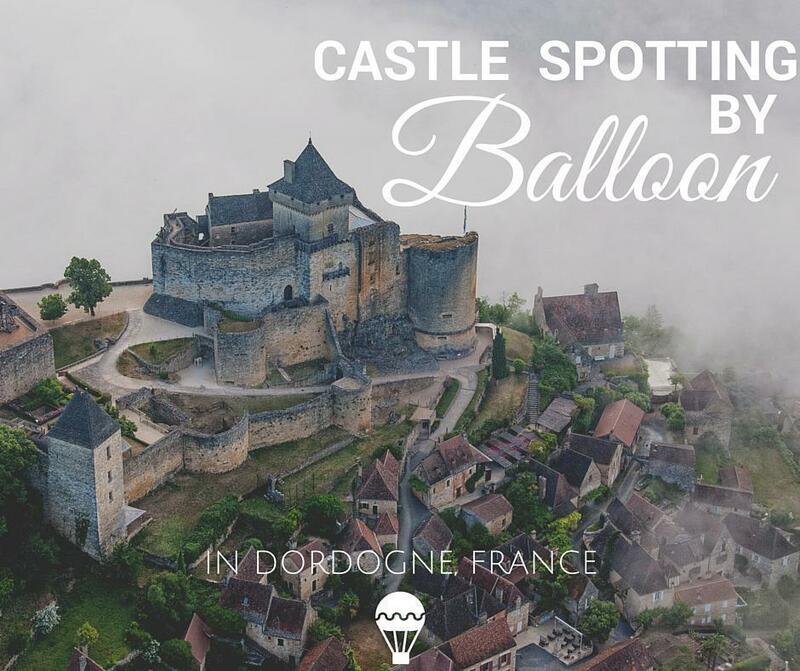 Our ultimate Dordogne-Perigord experience was an early morning hot air balloon flight to see the castles of the Dordogne. We don’t often set an alarm when we’re in Amelia. When you’re living in a motorhome, you’re pretty much up with the sun anyway. The problem was we had to get up before the sun. We groggily threw on some clothes and started brewing the coffee. With mugs in hand, we stumbled across the campground to the office. Our chauffeur for the morning was readying his bright blue van, adorned with a Kingfisher. But it was the contents of the trailer that filled us with excitement – a giant wicker basket. 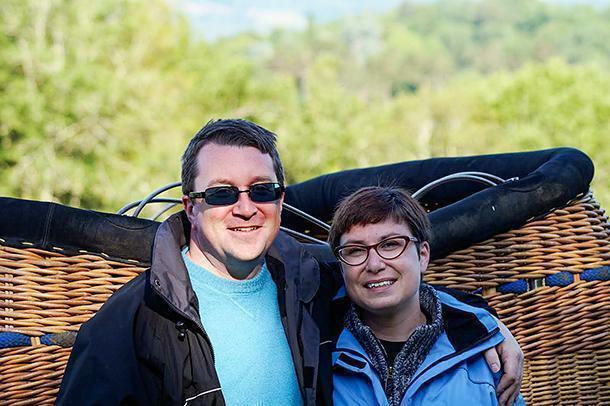 We were both about to take our first hot air balloon flight in one of Europe’s most stunning locations – over the castles of the Dordogne Valley, in Aquitaine, France. If only I wasn’t terrified of heights. On the way to our launch site, our pilot, Patrick Bécheau, joked he’s flown just about everything in his long career. After flying planes for decades, he took a hot air balloon ride with a friend and was immediately hooked. 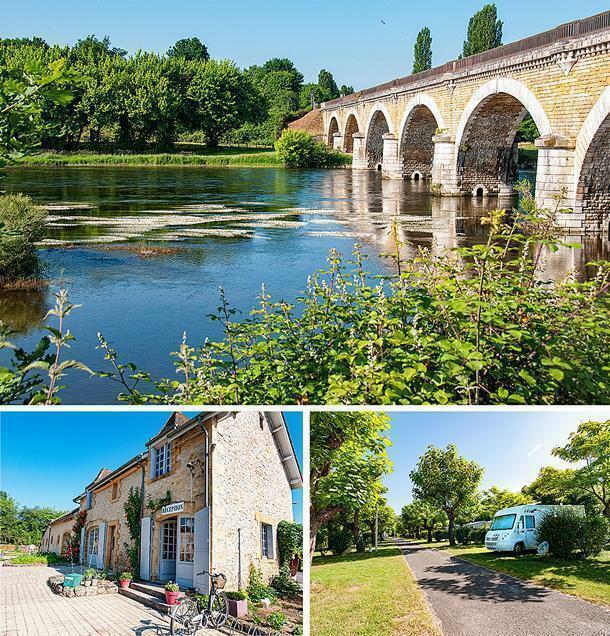 Now, Patrick spends his ‘retirement’ running the charming and sustainable Camping du Garrit, near Saint-Cyprien, with his wife, Régine, and giving balloon flights over his beloved Perigord. Patrick is joined by his crack ground-crew, Dominique Capuciny, a former policeman and now devoted balloonist. The four of us zip through the country roads, trailer in tow while Patrick examines several launch sites; aka farmer’s fields. Finally, he settles on one and he and Dominique have the balloon spread out on the ground in no time. The sun is just starting to warm the fields and the fog is so thick, I wonder if we’ll be able to see anything at all. But I have little time to wonder as Andrew and I are tasked with holding the balloon open, as it fills with hot air. Before I know it, Patrick is righting the basket and beckoning to us. I clamber inside with the grace of a newborn deer – short legs and balloon baskets are not a good mix. Patrick hits the gas, and we start to rise. Dominique quickly becomes a speck below us and I fight the urge to panic. But then, as we softly and silently rise into the air, the panic is gone and I loosen my death grip on the basket. I can’t take my eyes, and camera, off the beauty surrounding us. 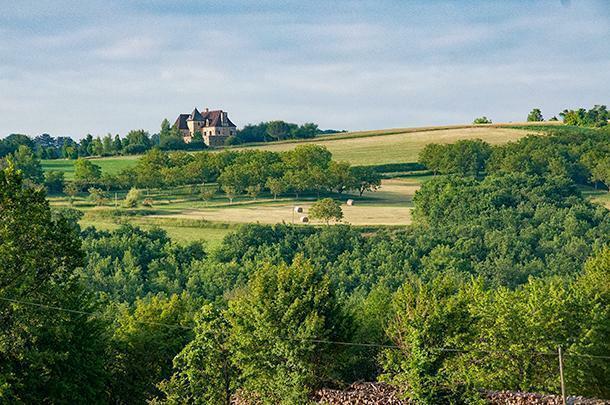 First we see the fields of Perigord stretching out below, like a patchwork quilt of greens and golds. The quilt is dotted with houses, some simple farms and some grand mansions. In the distance, Patrick points out a bank of cloud – the Dordogne River hides beneath it, along with the castles and chateaux that line its banks. Even if we don’t get to see the castles, our balloon ride is already in my top ten experiences in France list. We sail slowly towards the river, the silence punctuated only by blasts of propane to keep the balloon aloft. Then, peaking through the clouds, we start to see a shape. Beynac Castle seems to hover, shrouded in mist. We approach another imposing shape and it’s all I can do not to gasp. 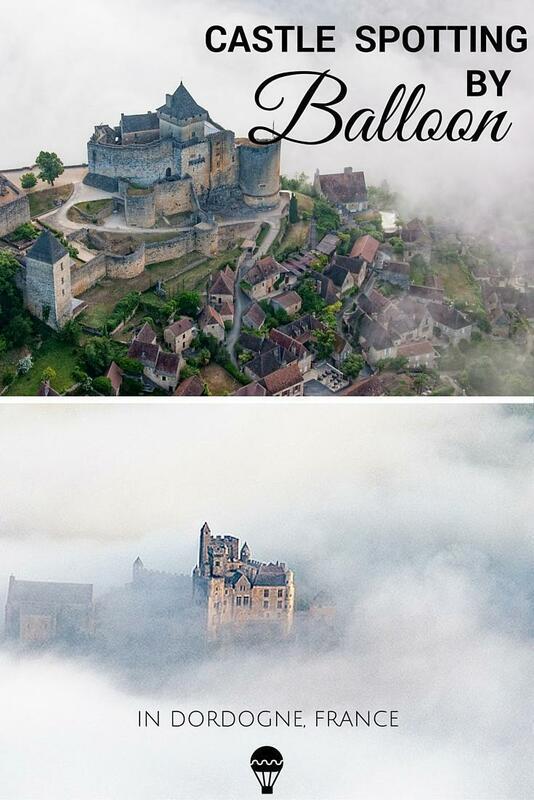 The Chateau de Castelnaud looks like something out of a fairytale. We hover quietly overhead while I take a hundred photos. Then, sadly our time in the air is up. Patrick looks for a good landing spot and we descend as quickly and softly as we went up. Patrick calls Dominique and he makes his way to the field to pick us up. When he arrives, Patrick pulls out a hamper and we have a breakfast of pastries and black coffee. Then we pack the balloon in its giant stuff sack and are quickly on the road back to the campground. 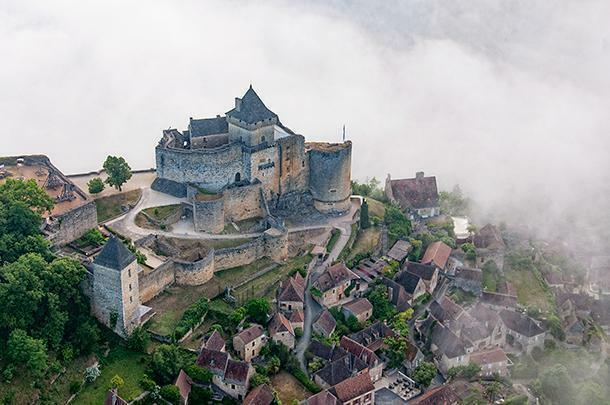 Along the way, we pass through Beynac-et-Cazenac, one of France’s Plus Beaux Villages, and home to our misty, floating castle. Less than an hour later, all of the morning fog has receded. The village is undeniably beautiful and the castle above is imposing, but it is not nearly as dramatic as our view from above. 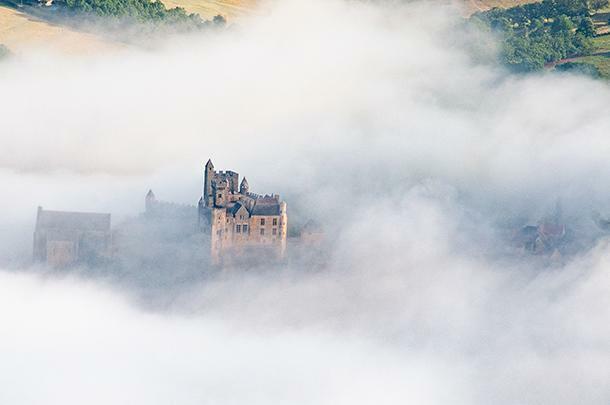 The Perigord-Dordogne region is stunning in and of itself, but hovering silently above the river, as the fog lifts and reveals the castles, is simply magical. Patrick offers a variety of hot air balloon flights in the Perigord-Dordogne region. One hour flights start at 200€ per person (the price decreases with additional people). We’d like to thank our captain, Patrick, Dominique, and Régine for an incredible balloon experience and a lovely stay at Camping du Garrit. We’d also like to thank the Comite Departemental du Tourisme Dordogne for hosting us in the area. As always, all opinions are our own.